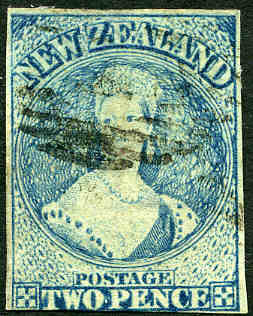 1855 1d Red Queen Victoria Chalons Head imperf on Blue paper used with 3 close margins, just touching at base. Sg 4. Catalogue Value $3,780.00. 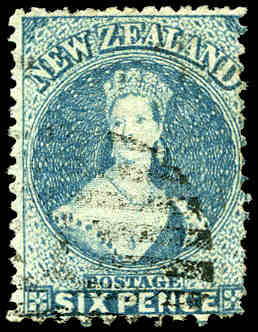 1856 2d Blue Queen Victoria Chalons Head imperf on Blue paper used with 4 margins, just touching at upper left, on piece. Sg 5. Catalogue Value $630.00. 1858 1d Dull Orange Chalons Head imperf No Wmk FU with close margins. Slightly cut into at lower right. Sg 8. Catalogue Value $1,365.00. 1855-1906 2d Chalons Head imperforate plate proof in black on thick white card in block of 24. 1862 3d Brown-Lilac perf 13 Queen Victoria Chalons Head with Large Star Wmk FU. Sg 74. Catalogue Value $945.00. 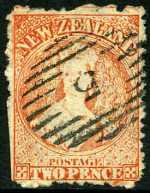 1862 6d Black-Brown "Pelure Paper" No Wmk perf 13 Chalons Head FU with few blunt perfs. Sg 93. Scarce. Catalogue Value $840.00. 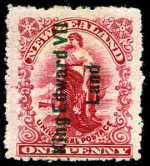 1864 1d Carmine-Vermilion Chalons Head imperf with NZ Wmk VFU 3 margin copy. Sg 97. Catalogue Value $735.00. 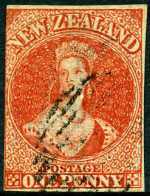 1864 1d Carmine-Vermillion Queen Victoria NZ Wmk Chalons Head imperf good used with 3 margins, slightly cut into at right. Sg 97. Catalogue Value $735.00. 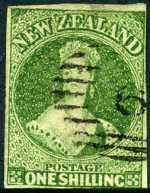 1864 1/- Green Chalons Head imperf with NZ Wmk VFU 3½ margin copy, close in places. Sg 100. Catalogue Value $578.00. 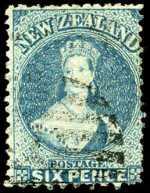 1864 2d Pale Blue Queen Victoria NZ Wmk Chalons Head imperf FU with 3½ margins, just touching at lower left. Sg 98. Catalogue Value $525.00. 1864 2d Pale Blue Queen Victoria NZ Wmk Chalons Head perf 13 good used with neat Otago cancellation. Sg 105. Catalogue Value $378.00. 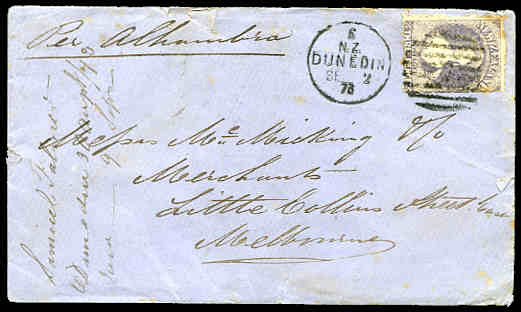 1873 Cover from Wellington to Arahura franked with 1864-67 1d Pale Orange Vermillion Queen Victoria Chalons Head, cancelled with 070 Numeral cancellation of Wellington. 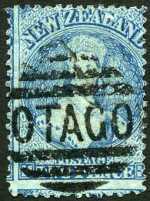 Hokitika CDS backstamp. Slightly trimmed at base. Sg 111. 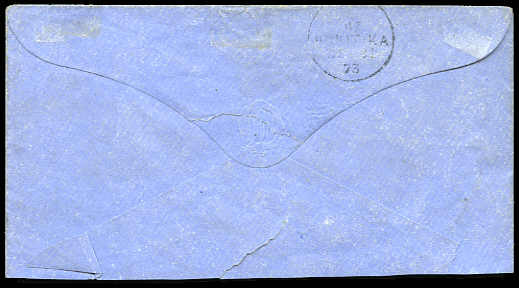 1864-67 3d Lilac Large Star Wmk perf 12½ Queen Victoria Chalons Head tied by Dunedin Duplex cancellation to 1873 cover addressed to Melbourne, Victoria with Melbourne CDS backstamp. Endorsed Per Alhambra. 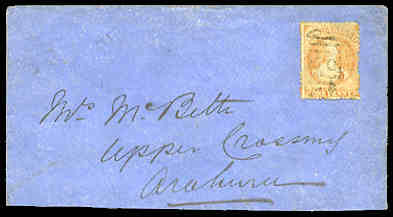 The recipient has written the senders name location and the date sent and received on the face of the cover. Few tone spots. 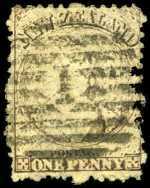 1871 6d Blue Large Star Wmk Chalons Head perf 12½ compound with 10 fine used. Few short perfs hardly detract. Sg 131c. Catalogue Value $945.00. 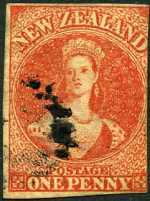 1872 1d Brown Queen Victoria No Wmk Chalons Head perf 12½ good used. Sg 137. Catalogue Value $400.00. 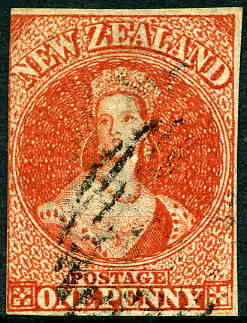 1872 2d Vermillion perf 12½ Lozenge Wmk Queen Victoria Chalons head FU and retouched with No 5 Barred Numeral cancellation of Campbelltown. Some trimmed perfs at lower left. 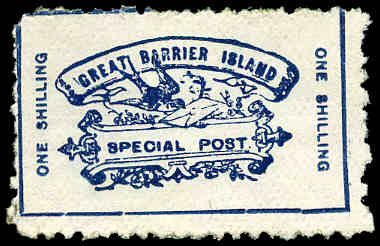 1946 R.P.S. certificate. Ex J.C. Thompson. 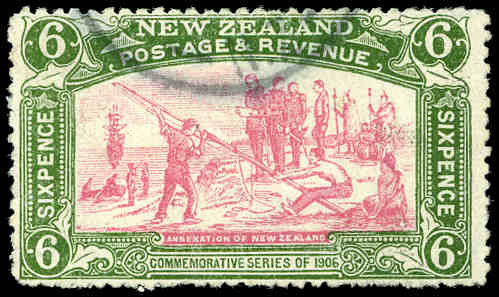 A rare stamp. Sg 142a. Catalogue Value $1,575.00. 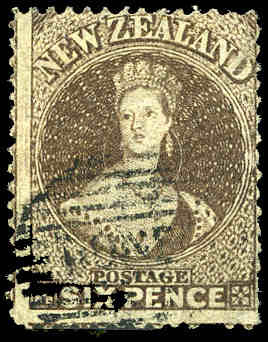 1878 5/- Grey Queen Victoria Sideface fine used. Minute tear in lower left corner perf. 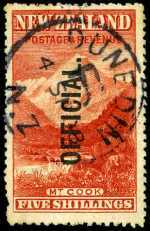 Sg 186. Catalogue Value $631.00. 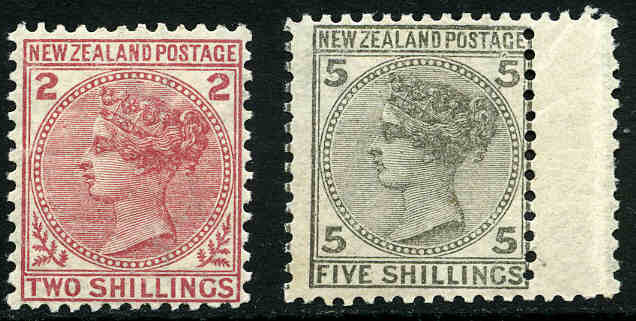 1874-78 Queen Victoria First Sideface set of 8 and 1892 ½d Bright Rose Queen Victoria Newspaper stamp with NZ and Star Wmk in fine mint lightly hinged condition. 3d value perf 12½ and other values perf 12 x 11½. Superb quality. 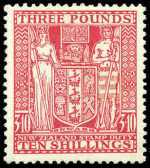 Sg 151, 154 and 180-186. Retail $2,300.00+. 1882-93 1d Rose Second Sideface Queen Victorian issues (53) with printed advertisements on reverse including some pairs. 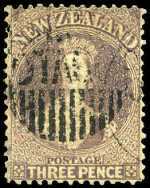 1892 6d Brown Die 2 perf 12 x 11½ Second Sideface Queen Victoria pair with 7mm NZ Star Wmk mint with original gum. Left unit with light stain at base. Sg 201a. Catalogue Value $463.00. 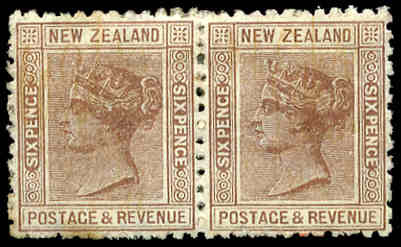 1895-1900 1d, 2d, 2½d, 3d, 4d and 6d Perf 11 Second Sideface Queen Victoria in fine mint condition. 6d value with few short perfs. Sg 237-241 and 243. Catalogue Value $497.00. 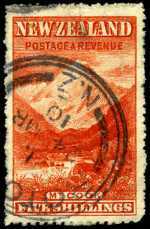 1902-06 5/- Deep Red Mt. Cook with upright NZ Star Wmk perf 14 FU. Sg 329a. Catalogue Value $595.00. 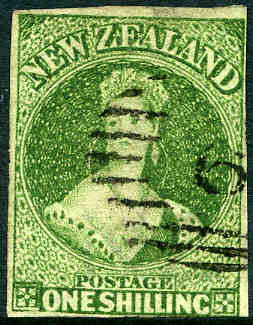 1906 6d Christchurch Exhibition fine used with reversed Wmk. Sg 373. 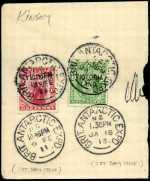 1908 3d Huia, 6d Kiwi and 1/- Kea and Kaka reduced size perf 14 x 15 Pictorials MLH and 1908 1d Universal with diagonal lines on globe MUH. 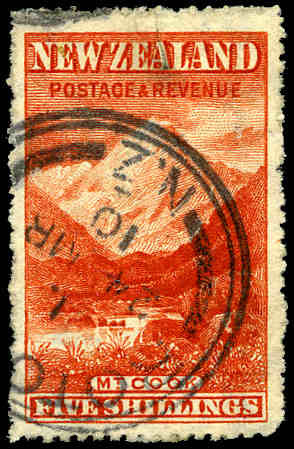 1/- with faint crease. Sg 383-386. Catalogue Value $437.00. 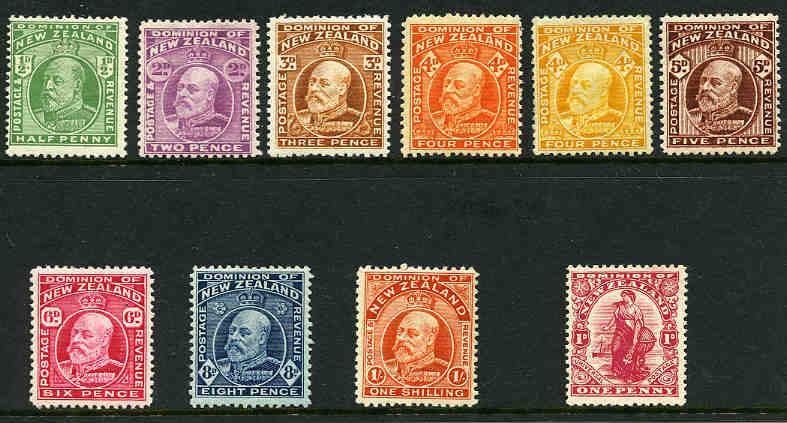 1909 KEVII set of 10 including 1d Universal MLH. 8d value with few short perfs. 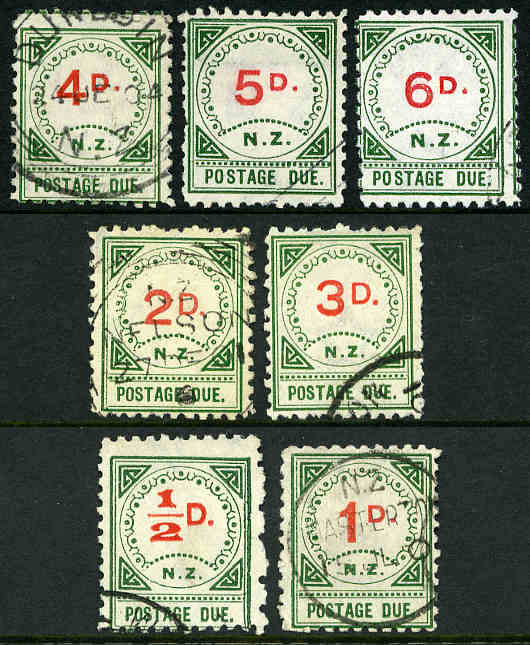 1909 KEVII set of 10 MLH including 1d Universal MUH. 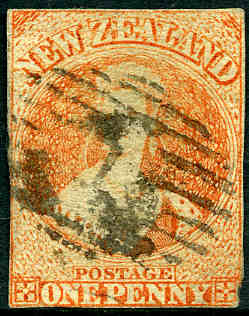 4d Orange-Yellow with faint crease. Retail $290.00. 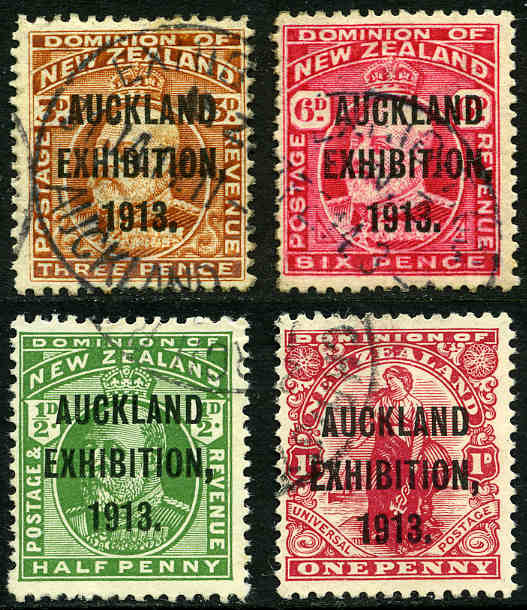 1913 Auckland Exhibition set fine used. Sg 412-415. 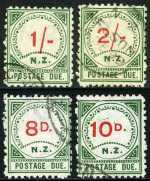 1925 Dunedin Exhibition set, plus addtional 4d value with "POSTAGF" at right variety fine used. Sg 463-465 and 465a. Catalogue Value $523.00. 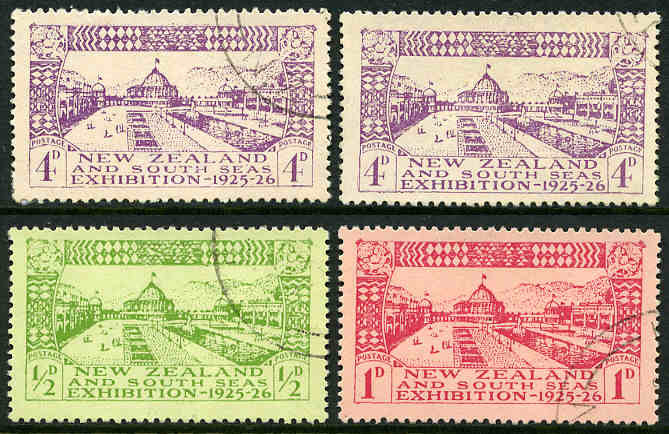 1925 Dunedin Exhibition set MLH, 1931 Smiling Boys set MLH and 1968 $2.00 Multicolour Geyser (2) VFU. Smiling Boys set with faults. 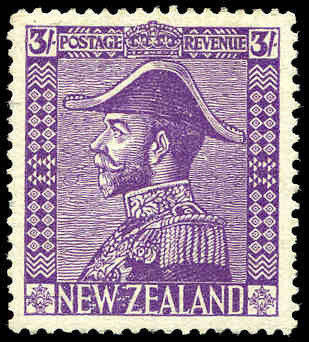 1926 3/- Mauve Admiral MVLH and well centered. Sg 467. Retail $200.00. 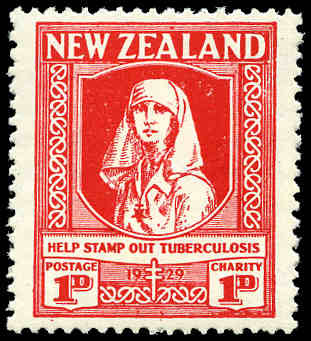 1929 1d + 1d Nurse Health stamp MUH. 1931 Smiling Boys Health set MLH. Sg 546-547. 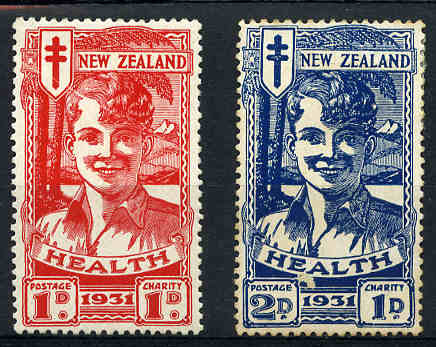 1932 1d Hygeia Health and 1954-63 QEII Official set MUH. Sg 552 and 0159-0167. Retail $135.00. 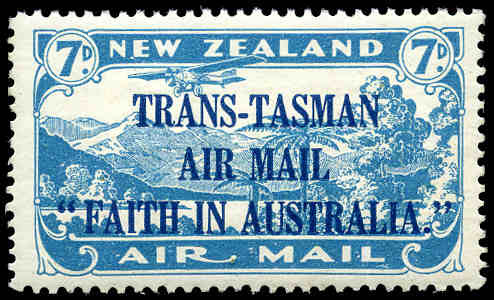 1934 7d Blue Trans-Tasman Airmail MUH and well centered. Sg 554. Retail $90.00. 1970 4¢ Puriri Moth with Bright Green (Wing veins) omitted MUH. Sg 919c. Catalogue Value $525.00. 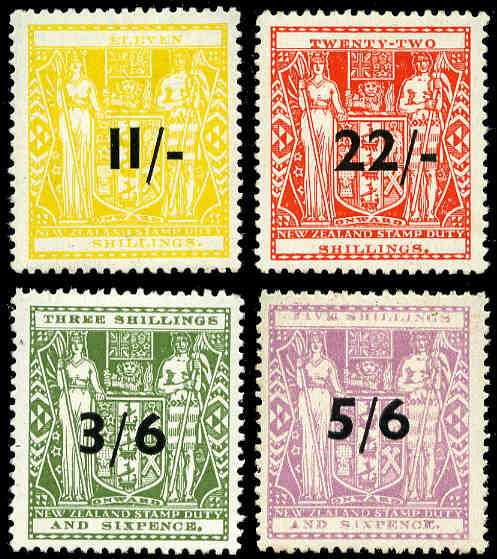 1973, 1974, 1975, 1976, 1977, 1985, 1986, 1987 and 1988 Commemorative Year packs, plus small range of MUH Decimal issues. 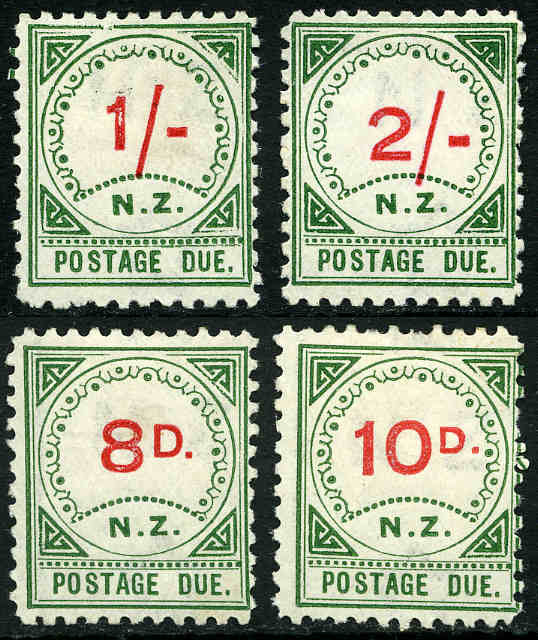 Face Value NZ$133.00. Complete set of Post Office Year albums from 1984 to 1999 all without outer plastic wrappers. Face Value NZ$792.00. 1984, 1985, 1986, 1987 and 1990 Post Office Year albums. 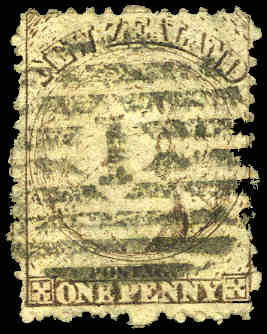 Face Value NZ$126.00. 1984, 1985, 1986, 1987, 1990, 1991 and 1992 Post Office Year Albums. 1991 without plastic wrapper. 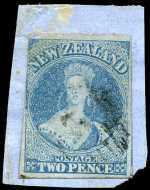 Face Value NZ$222.00. Complete set of Post Office Year albums from 1985 to 1992. 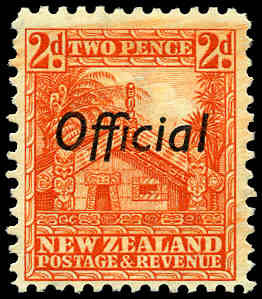 Face Value NZ$291.00. Collection of mostly miniature sheets and presentation packs mainly from the 1990's. 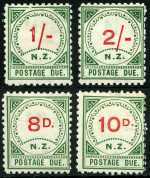 Face Value NZ$321.00. 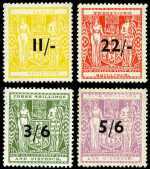 Collection of MUH stamps, miniature sheets and booklets with main strength in the 1981 to 1993 period. 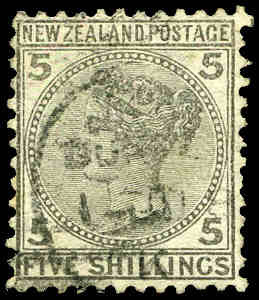 Face Value NZ$355.00. 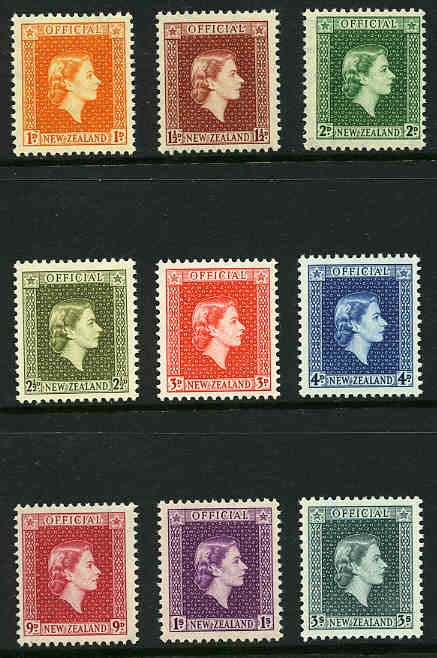 Collection of CTO stamps, miniature sheets without gum, as well as a few booklets, the main strength in the 1981 to 1993 period. Face Value NZ$349.00. 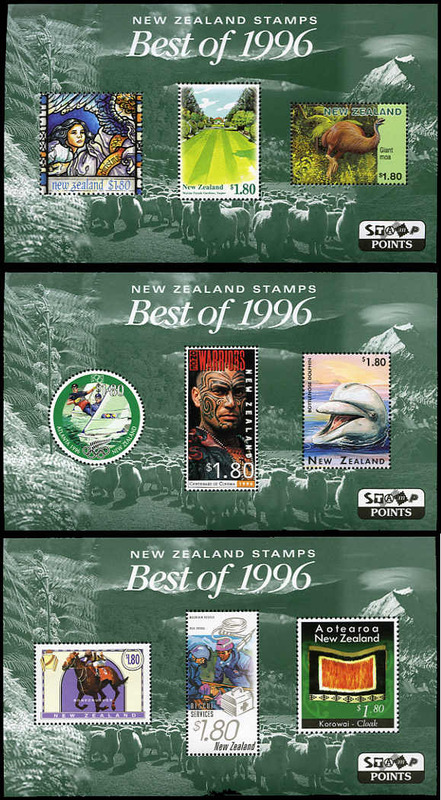 New Zealand Post Bonus "Stamp Points" Best of 1996 and Best of 1999 (2), each containing 3 miniature sheets in special pack. 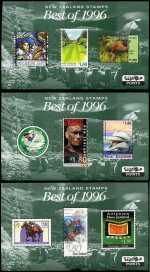 New Zealand Post Bonus "Stamp Points" selection of 18 different souvenir prints from 1997 to 2000, each with relevant set of stamps cancelled at base. Odd minor blemish. 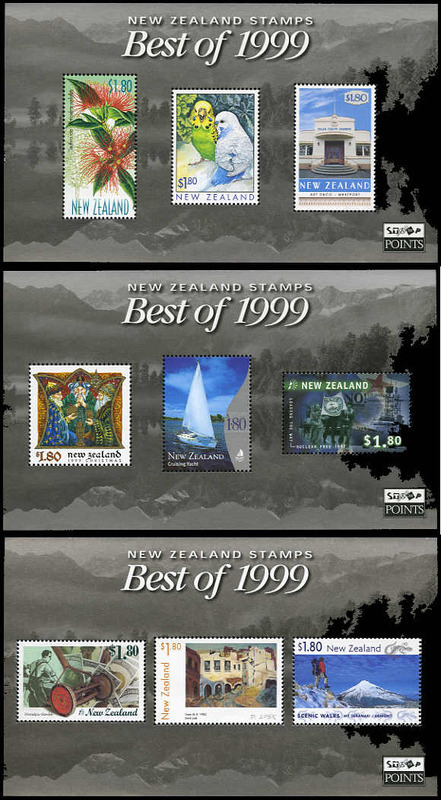 1999 Scenic Walks, 1999 Yachting, 2000 Spirits and Guardians and 2000 On The Road special limited edition albums containing miniature sheet, set of stamps in pairs, colour separations of the highest value, signed FDC, imprint corner strips of 3 or blocks of 6 sets and detailed booklet with certificate of authenticity. All numbered 1794/2000. 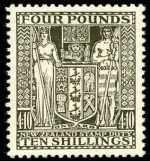 Also 1990 Heritage collection of MUH stamps and FDC's in special limited edition album. Very high retail value. Selection of Year Packs and Presentation Packs from 1971 to 1987. 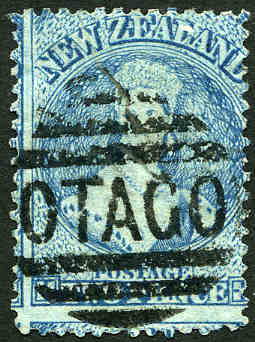 Face Value NZ$168.00. 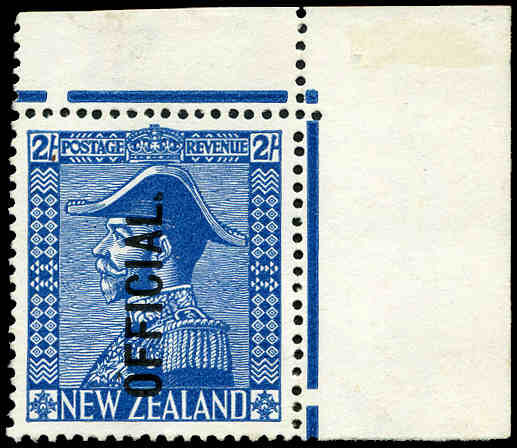 Extensive specialised collection of mint and used stamps with many perforation, watermark and paper variations commencing with a good range of Chalons head issues and then a very good representation through to 1975. Many better items, as would be expected with such a high catalogue value. An odd fiscal and some faults, but includes many items with a high retail value in good condition. Well worth inspecting. 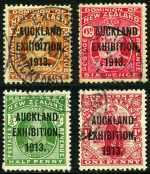 Catalogue Value $46,900.00++. 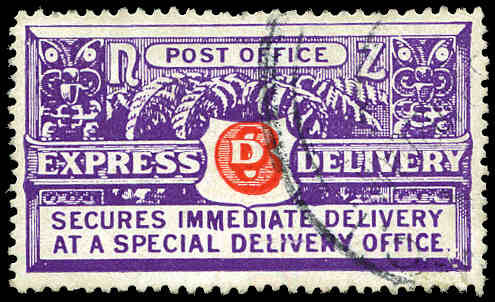 1939 6d Vermilion and Bright Violet "Wiggins Teape" paper perf 14 x 15 Express Delivery stamp FU with tiny repaired tear. Sg E5. Catalogue Value $524.00. 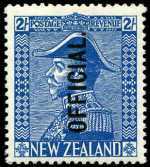 1898 Great Barrier Island 1/- Deep Blue Pigeongram "Special Post" stamp MUH. Rarely seen in such fine condition. 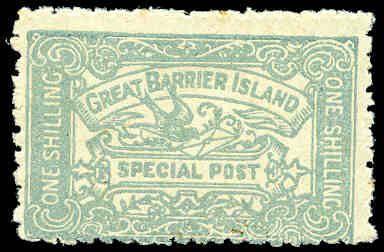 1899 Great Barrier Island 1/- Greenish-Blue Pigeongram "Special Post" stamp MLH. Rarely seen in such fine condition. 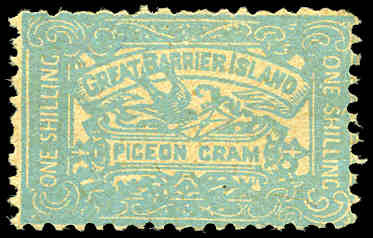 1899 Great Barrier Island 1/- Greenish-Blue on Buff Pigeongram stamp with "Pigeon Gram" inscription mint without gum. 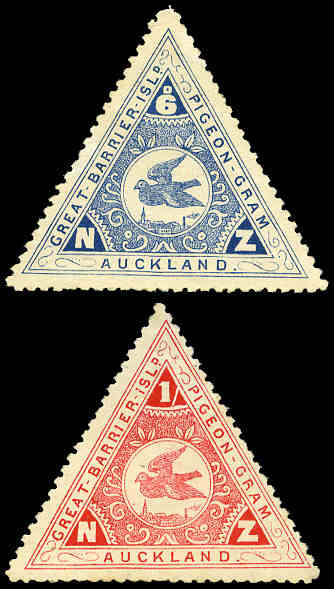 1899 Great Barrier Island 6d Blue and 1/- Red Triangular Pigeongram stamps MLH. 6d without gum and 1/- with tiny thin. 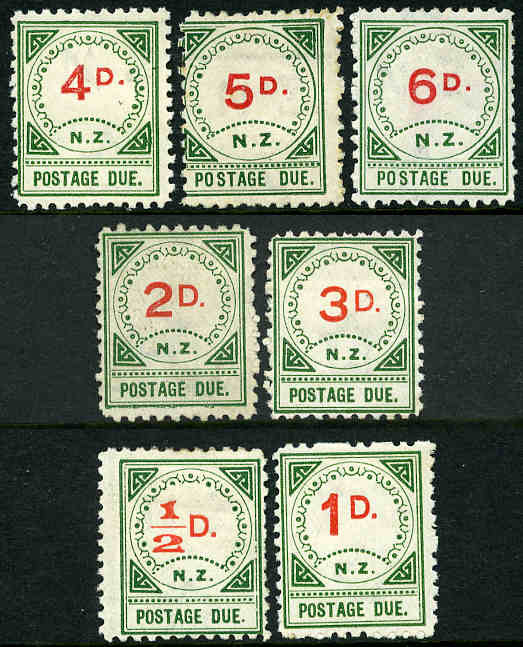 1899 Postage Due set of 11 in fine mint condition. 2d without gum and 5d with faint tone spots. SG D2-D4, D6-D12 and D16. Retail $860.00. Catalogue Value $1,005.00. 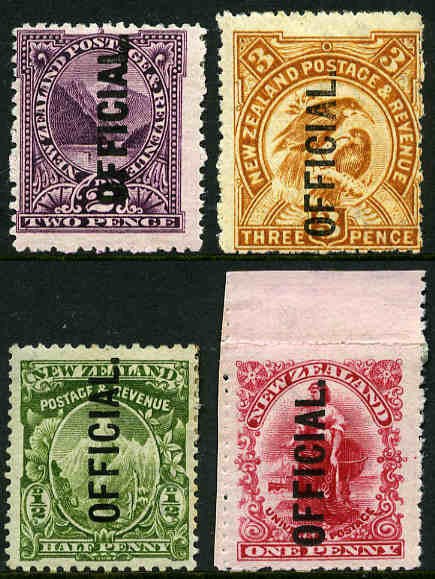 1899 Postage Due set of 11 fine used. Few niggly perfs hardly detract. SG D2-D4, D6-D9, D11, D12, D14 and D16. Retail $1,100.00. 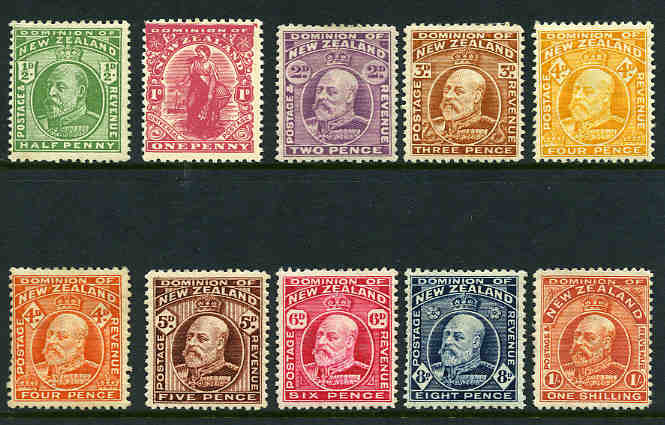 1907-08 Pictorial Definitive set of 8 O/P Official MLH. 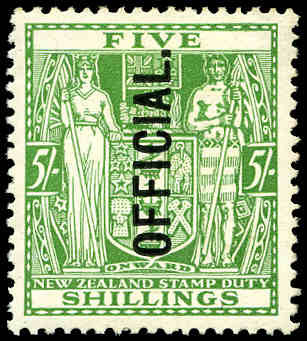 ½d with faint toning, 2/- MUH and 5/- with small thin. Sg 060-069. Catalogue Value $1,195.00. 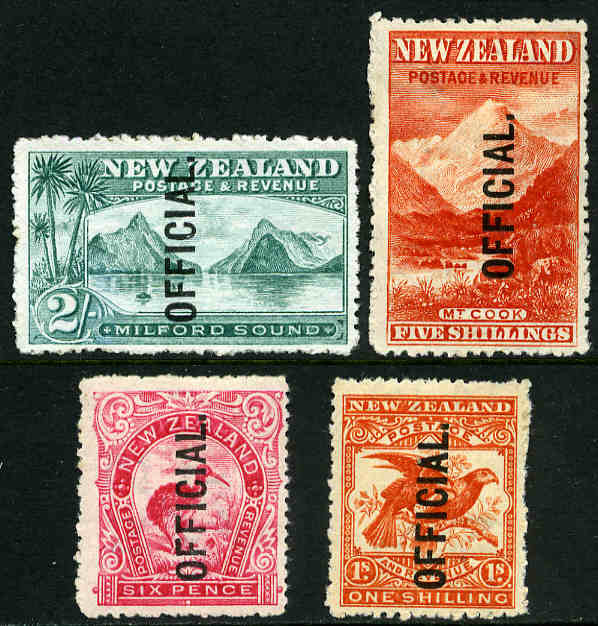 1907-08 Pictorial Definitive set of 8 O/P Official FU. Sg 061-070. Catalogue Value $655.00. 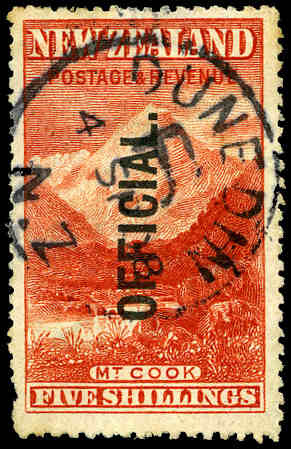 1907 5/- Deep Red Mt. Cook O/P Official FU with perf faults at lower left and very slight toning. Sg 067. Catalogue Value $378.00. 1909 6d Pink Kiwi reduced size perf 14 x 15 O/P Official MUH. 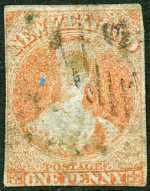 Two barely visible toned perfs. Sg 072. Retail $600.00. 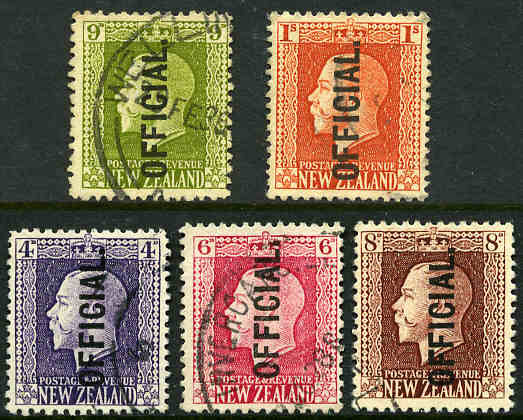 1910-16 KEVII set O/P Official MLH. Sg 073-078. Retail $210.00. 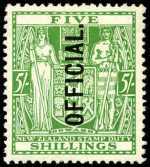 1915 2/- Blue and 5/- Yellow-Green perf 14½ x 14 Queen Victoria Postal Fiscal stamps O/P Official MLH. 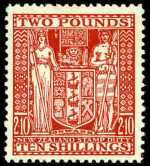 2/- with rough perfs and minute tear. Sg 085 and 086. Catalogue Value $264.00. 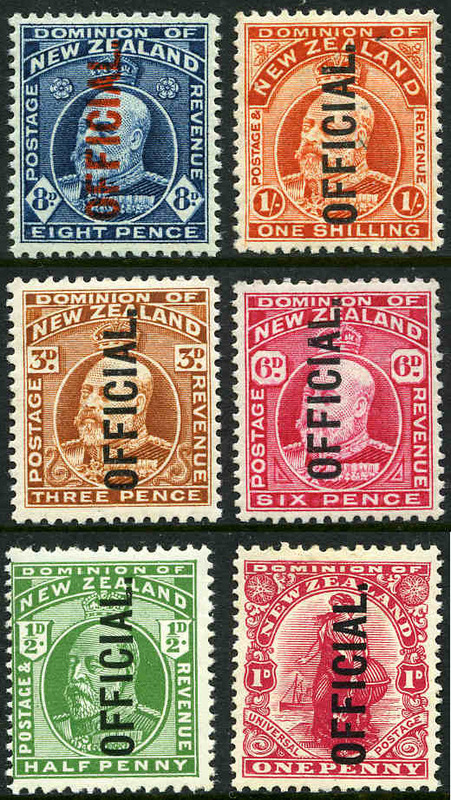 1915-25 KGV set of 6 O/P Official MLH. 3d, 6d and 9d MUH. Sg 0101-0105. Retail $395.00. 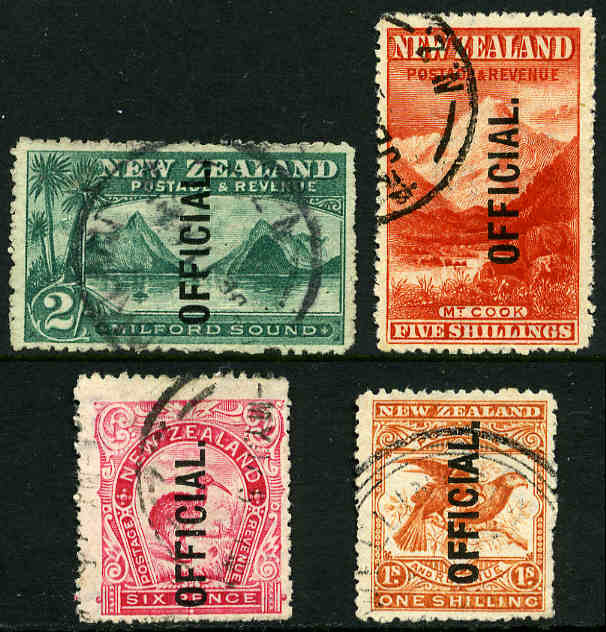 1915-25 4d, 6d, 8d, 9d and 1/- KGV O/P Official fine used. Sg 0101-0105. Retail $240.00. 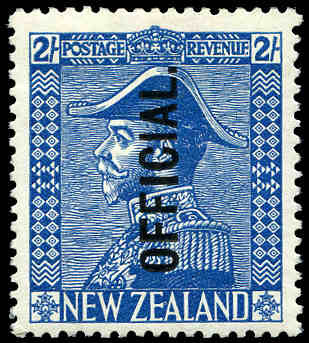 1928 2/- Light Blue Admiral O/P Official upper right corner copy mint without gum. Sg 0112. Catalogue Value $157.00. 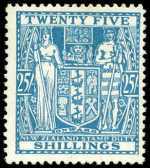 1928 2/- Light Blue Admiral O/P Official MLH and well centered. Sg 0112. Retail $170.00. 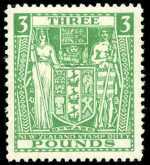 1933 5/- Green Arms with vertical Official overprint MLH with some light gum toning. Attractive frontal appearance. Sg 0113. Catalogue Value $578.00. 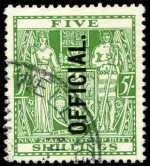 1933 5/- Green Arms with vertical Official overprint fine used. Sg 0113. Catalogue Value $683.00. 1942 2d Orange perf 12½ Multiple Wmk Pictorial O/P Official MLH. Scarce. Sg 0123b. Catalogue Value $398.00. 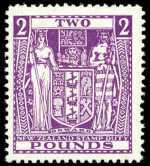 1935 12/6 Deep Plum Arms with Single NZ Star Wmk MLH and centered to base. Sg F156. Retail $350.00. 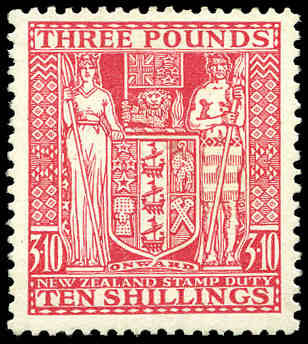 1931-35 12/6 Deep Plum, £2.10/- Red and £4 Light Blue Arms with Single NZ Star Wmk fine used with Stamp Duties C.D.S. cancellations. £4 with light vertical crease. Sg F156, F163 and F166. Catalogue Value $1,480.00. 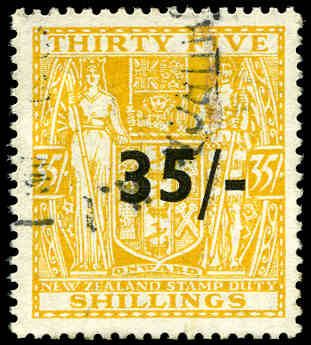 1931 35/- Orange-Yellow "Cowan" paper Arms with Single NZ Star Wmk MVLH and well centered. Rare. Sg F161. Catalogue Value $6,835.00. 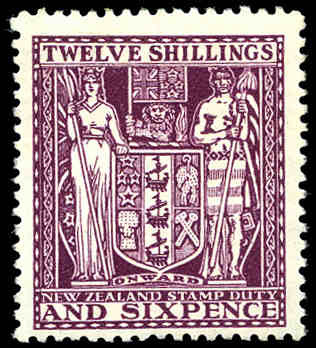 1935 £3.10/- Rose Arms with Single NZ Star Wmk MVLH with faint tone spots on gum. Sg F165. Catalogue Value $3,155.00. 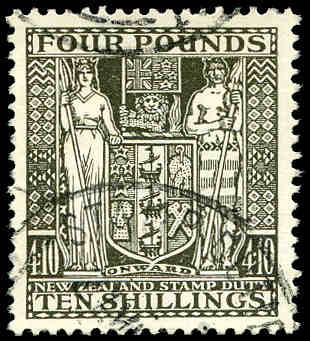 1935 £4.10/- Deep Olive-Grey Arms with Single NZ Star Wmk MVLH and well centered. Sg F167. Catalogue Value $2,735.00. 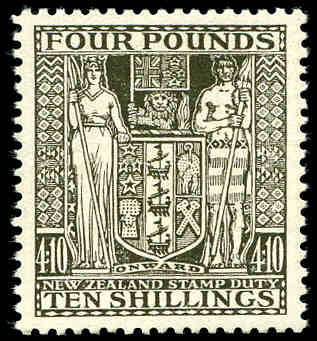 1935 £4.10/- Deep Olive-Grey Arms with Single NZ Star Wmk fine used with Stamp Duties C.D.S. cancellation. Sg F167. Catalogue Value $2,940.00. 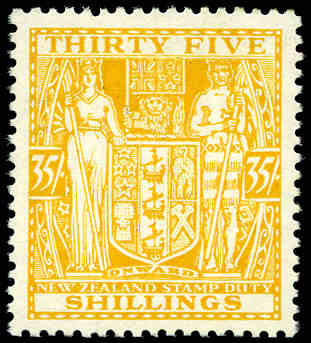 1939 35/- on 35/- Orange-Yellow Arms MUH and well centered. Faint tone spots on gum hardly detracts. Sg F186. Catalogue Value $1,000.00. 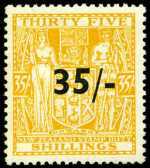 1939 35/- on 35/- Orange-Yellow Arms fine used with Stamp Duties C.D.S. cancellation. Sg F186. Catalogue Value $528.00. 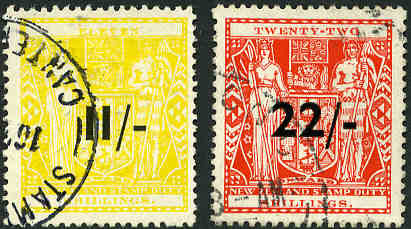 1940 22/- on 22/- Scarlet Arms with Single NZ Star Wmk and 1942 11/- on 11/- Yellow Arms with Multiple NZ Star Wmk fine used with Stamp Duties C.D.S. cancellations. Sg F190 and F215. Catalogue Value $783.00. 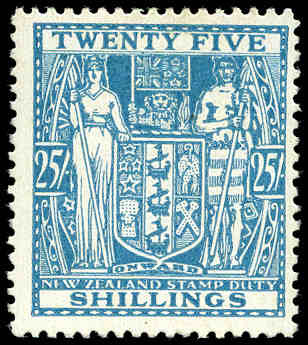 1946-48 25/- Greenish Blue, 30/- Brown and £3.10/- Rose Arms with Multiple NZ Star Wmk fine used with Stamp Duties C.D.S. cancellations. Sg F204, F205 and F209. Catalogue Value $3,720.00. 1946 25/- Greenish Blue Arms with Multiple NZ Star Wmk MVLH and centered to right. 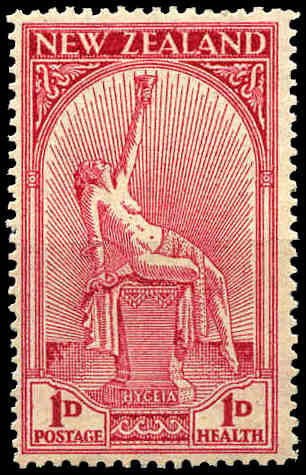 Sg F204. Catalogue Value $943.00. 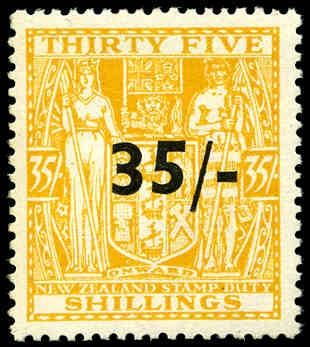 1949 30/- Brown Arms with inverted Multiple NZ Star Wmk MUH and well centered. Sg F205w. Catalogue Value $631.00. 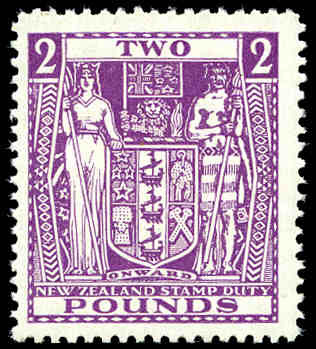 1946 £2 Bright Purple Arms with Multiple NZ Star Wmk MUH and centered to left. 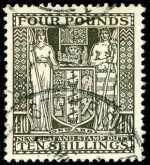 Sg F206. Retail $300.00. 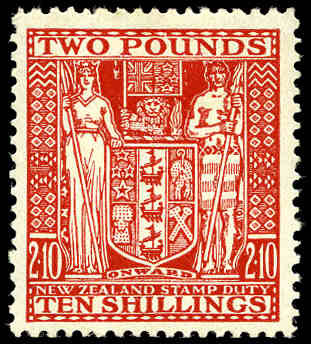 1951 £2.10/- Red Arms with Multiple NZ Star Wmk MUH and reasonably centered. 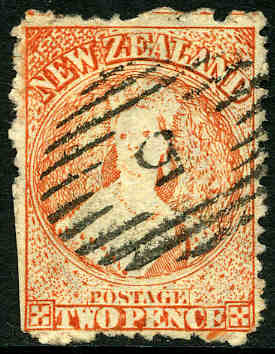 Sg F207. Catalogue Value $685.00. 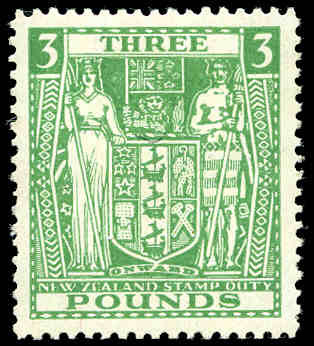 1952 £3 Green Arms with inverted Multiple NZ Star Wmk MVLH and well centered. 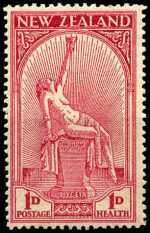 Sg F208w. Catalogue Value $316.00. 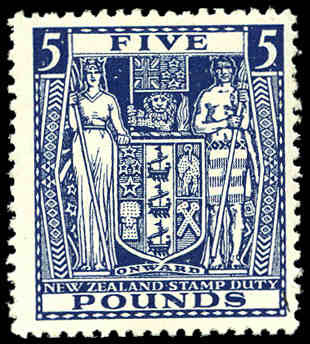 1950 £5 Indigo-Blue Arms with inverted Multiple NZ Star Wmk MVLH and centered to upper right. Sg F211w. Catalogue Value $420.00. 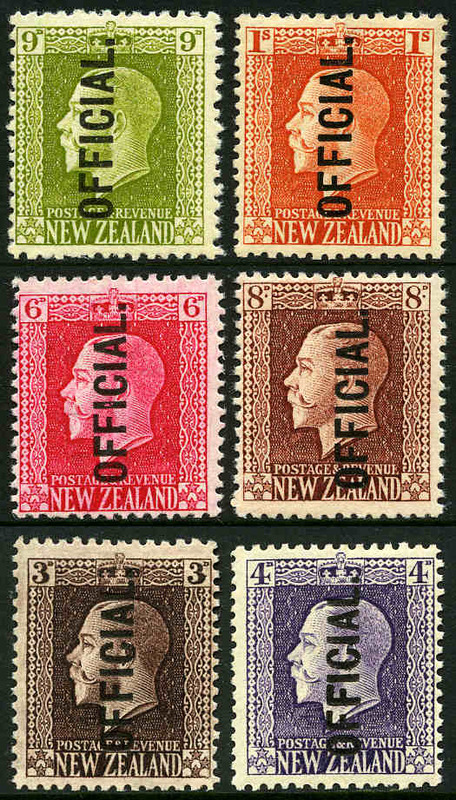 1942-50 3/6 on 3/6 Grey-Green Type I, 5/6 on 5/6 Lilac, 11/- on 11/- Yellow and 22/- on 22/- Scarlet Arms with Multiple NZ Star Wmk MUH. 5/6 on 5/6 with Inverted Wmk and 11/- on 11/- MLH. Sg F212, F214w, F215 and F216. Catalogue Value $1,030.00. 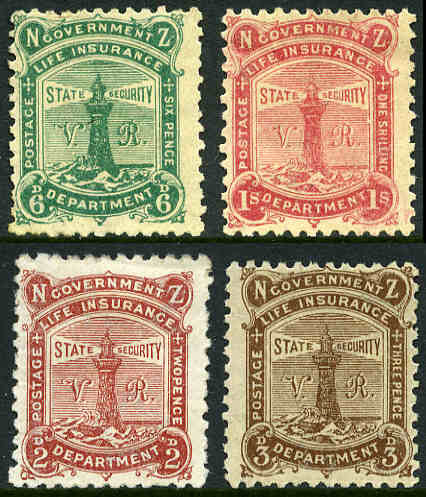 1891-98 2d, 3d, 6d and 1/- perf 12 x 11½ Life Insurance "VR" Lighthouses in fine mint condition. Superb quality. Sg L3-L6. Retail $1,560.00. 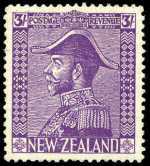 Victoria Land; 1908 1d Royle Print Universal Postage O/P King Edward VII Land MLH. Faint toning at base. Sg A1. Catalogue Value $891.00. 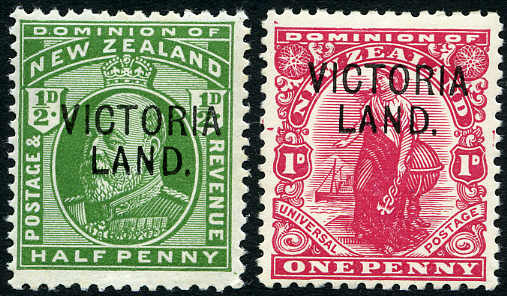 1911 ½d Green and 1d Carmine Victoria Land with forged overprints MUH. 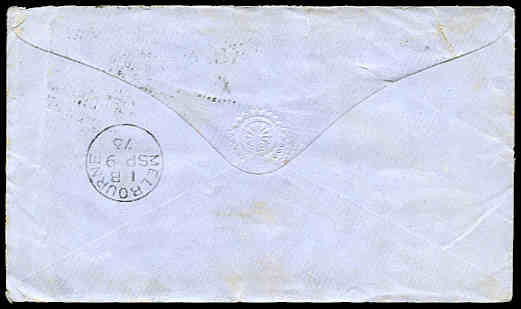 Ceremuga certificate stating overprints are forged. Sg A2 and A3. 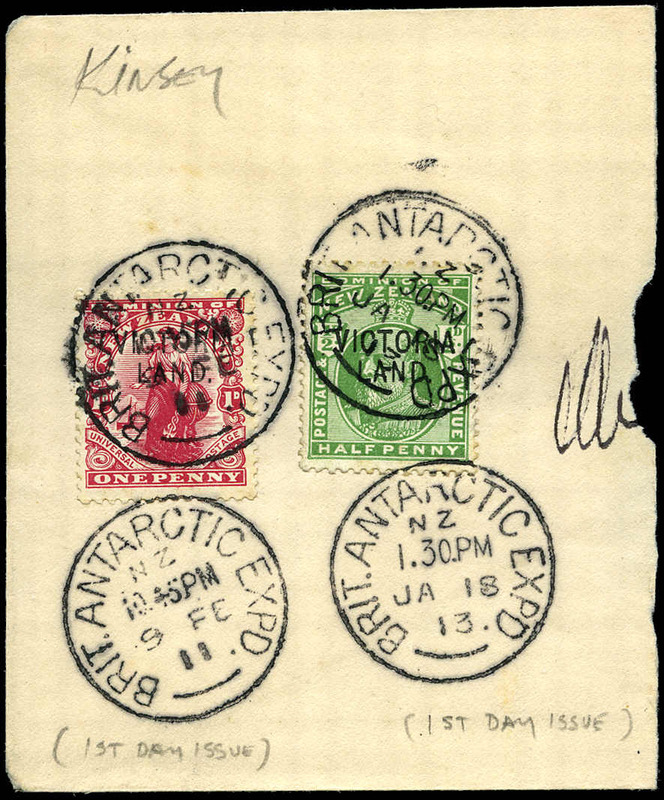 1911 ½d Green and 1d Carmine Victoria Land with forged overprints on piece tied by forged "BRIT ANTARCTIC EXPD" cancels. 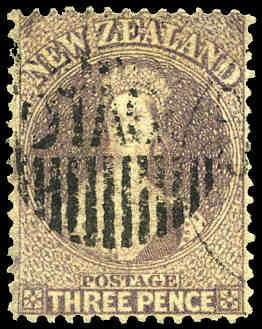 Ceremuga certificate stating overprints and cancels are forged. Sg A2 and A3. Collection of hundreds of MUH, MLH and used stamps from 1898 to 1982 including range of handy items and numerous sets in Seven Seas Standard and Hingeless albums. 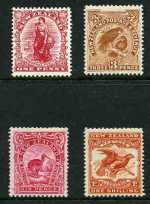 Accumulation of 236 used higher value Pre-Decimal and Decimal definitive issues, comprising $1.00 to $10.00 values in small stockbook. Mainly good to fine used with some duplication. Catalogue Value $1,000.00+. 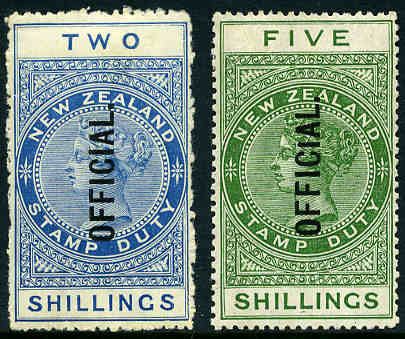 Accumulation of 285 used Pre-Decimal and Decimal stamps from 1915 to 1970's including many higher value Definitive issues. Mainly good to fine used with some duplication. Odd fault. 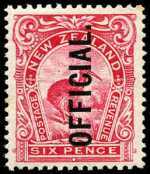 Collection of many hundreds of mostly used stamps from early to modern including range of handy items and numerous sets in 3 stockbooks. Some duplication. 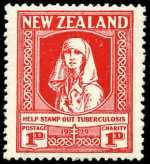 Selection of 148 mint stamps from 1913 to 1960 including 1920 Victory set, 1925 Dunedin Exhibition set, 1929 1d Nurse Health, 1931 Smiling Boys Health set (2d small thin), 1931 5d on 3d Airmail, 1934 7d Trans-Tasman Airmail, 1935 Definitive set (2), 1935 Silver Jubilee set (2), 1940 Centennial set O/P Official, 1944-47 Lighthouse set and other handy issues. Mainly MLH with odd minor fault. 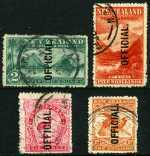 Collection of mostly used stamps from 1857 to 1986 in Tasman loose leaf album including 1857 2d Blue No Wmk Chalons Head imperf, 1898 5/- No Wmk perf 12 to 16 Mt Cook, 1920 Victory set, 1925 4d Dunedin Exhibition, 1929 and 1930 1d Nurse, 1931 Airmail set, 1931 5d on 3d Airmail, 1931 Smiling Boys set, 1932 1d Hygeia, 1933 1d Pathway, 1934 1d Crusader, 1935 Silver Jubilee set and 1954-57 QEII Definitive set. Generally fine used condition with some minor faults. High retail value. 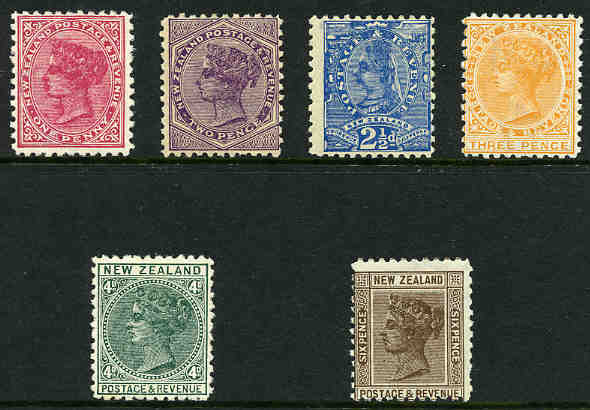 Selection of 194 used stamps from 1864 to 1981 including better items and small range of Queen Victoria Duty stamps. 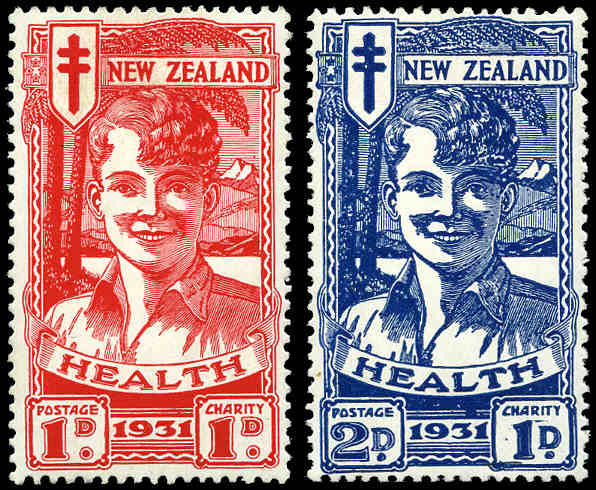 Noted 1931 Smiling Boys Health set, 1931 Airmail set, 1932 1d Hygeia Health, 1933 1d Pathway Health, 1935 Definitive set O/P Official, 1940 Centennial set O/P Official and 1954-63 QEII Official set good used. Generally fine condition with some faults. Largely complete MUH collection from 1953 Coronation set to 1994 Cricket Centenary set excluding a few later issues only on Seven Seas Hingeless album pages in 2 binders. 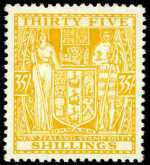 Includes all Health miniature sheets, Lighthouse and Ross Dependency issues and 1958 2d on 1½d QEII with Stars with forged overprint. Odd lesser item and some Health miniature sheets with slight faults. 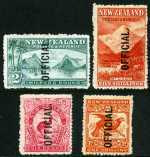 Also 1990 New Zealand Heritage Stamp Collection in special album. 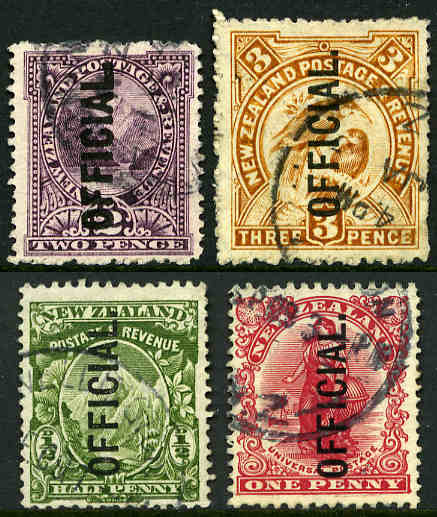 Selection of 460 mint and MUH stamps from a range of periods in small stockbook. Some duplication. 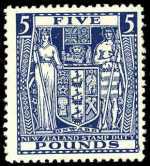 Accumulation of 262 mainly used stamps from Queen Victoria to KGVI including many better and highly catalogued items. 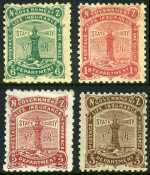 Considerable duplication and condition varies. Very high catalogue value. 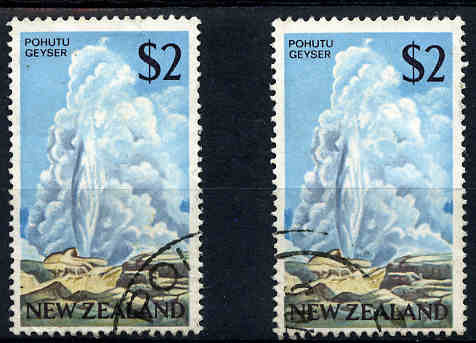 Accumulation of 410 used higher value commemorative stamps on piece from the 1990's to 2005 comprising $1.00, $1.20 and $1.50 values. Mainly good to fine used with some duplication. Accumulation of 302 used higher value commemorative stamps from the 1990's to 2005 comprising $1.00, $1.20 and $1.50 values in small stocbook. 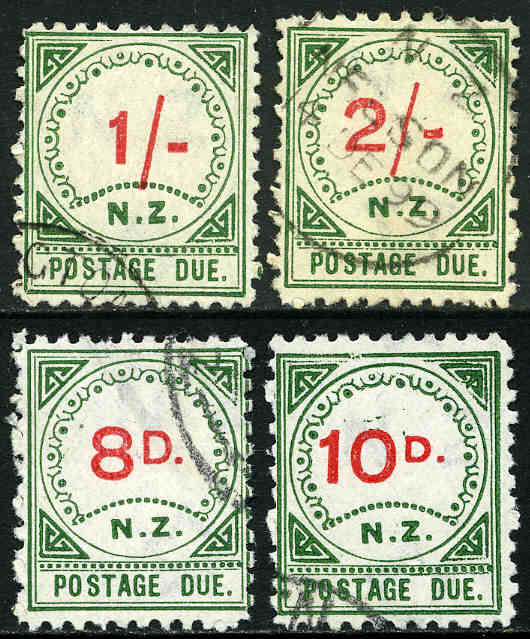 Mainly fine to very fine used with some duplication. Accumulation of several thousand used stamps off paper, plus bundle of FDC's and over 3kg of on paper mixture in carton.